Judy Wertz, age 77 of Grinnell, passed away on Saturday, December 1, 2018 at Grinnell Regional Medical Center. A funeral service will be held 10:30 a.m. on Wednesday, December 5th at the Smith Funeral Home in Grinnell with Rev. John Epperson officiating. Casket bearers are Mike Shutts, Chris Duncan, Dalton Lender, Justin White, Chris Coffman, Doug Cameron, Tom Collum, and Bruce Hidlebaugh. Interment will be at Hazelwood Cemetery in Grinnell. A reception will follow at the Grinnell Eagles. Visitation will begin at 2:00 p.m. on Tuesday at the Smith Funeral Home and her family will receive friends from 4:00 p.m. until 7:00 p.m.
Memorials may be designated to the Judy M. Wertz Memorial Fund, to benefit the Davis School 4th Grade Y Camp, mailed in care of the Smith Funeral Home, PO Box 368, Grinnell, Iowa 50112. Judith Marie Sumpter was born on March 5, 1941 in Grinnell, Iowa to Dwain Preston Sumpter and Helen Elizabeth (Nelson) Sumpter. She was raised in Grinnell and graduated from Grinnell High School with the class of 1959. Judy was united in marriage to Phillip Wertz on November 20, 1960 at the Friends Church in Grinnell. They were blessed with a daughter, Kimberly Ann Wertz. Judy worked at General Telephone (GTE) in Grinnell shortly after their marriage. 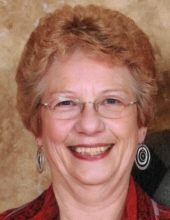 In 1972, she began her longtime career as a Paraeducator at Davis Elementary School in Grinnell. After 44 years of helping children at Davis School, she retired in 2016. Judy devoted much of her life to improving the lives of others, especially the children of Davis Elementary School. She dearly loved her family and looked forward to attending her grandson, Dalton’s school sporting events. Her enjoyments included gardening, canning, cooking, baking, reading, going shopping with her daughter, Kim, and traveling to Chicago to visit her brother, Ron. She will be remembered for the love of her family, for being selfless, and always putting others needs ahead of hers. Judy is survived by her husband of 58 years, Phil Wertz of Grinnell; her daughter, Kim Lender of Grinnell; grandson, Dalton Lender of Grinnell; and siblings, Donald (Mary) Sumpter of Grinnell, Vicky Langford of Grinnell; and Ron Sumpter of Chicago, Illinois. She was preceded in death by her parents; son-in-law, Don Lender in 2016; sister, Donna Nevitt; and infant sister, Rebecca Sumpter. To send flowers or a remembrance gift to the family of Judy M. Wertz, please visit our Tribute Store. "Email Address" would like to share the life celebration of Judy M. Wertz. Click on the "link" to go to share a favorite memory or leave a condolence message for the family.